The times they are a changing. And so is khadi, the fabric that embodies the spirit of both ancient and modern India. Over time we will be exploring its evolution, providing blogs and useful resources. The main focus of this article is on cotton khadi. It is cotton which made Indian fabrics so special. It still does. We will look in some detail at how Gandhi enriched the spirit of Indian textiles. He revived khadi a hundred years ago. Khadi became a symbol of simplicity, freedom and peace. The story does not end there. Khadi now has a global relevance. It has the potential to become a premium ethical and eco fabric. Many of us are busy helping khadi realise this potential, giving it a New Look. We will explore these initiatives in depth. Hence the title. Indian fabrics have been famous world wide since ancient times. They include a wide range of textures and weaves – from coarse cloth to the highly refined fabrics that were made in Dhaka and Benaras. These fabrics seem to have been around as far back as the 19th Century BC as the soapstone image from a site of Mohanjo-daro seems to indicate. Soapstone Image of the ‘Priest-King’ found in 1927, wearing a cloak with circular motifs. Rich textile traditions evolved. There was support from royalty as well as religious establishments. Standards were often set and regulated by guilds. 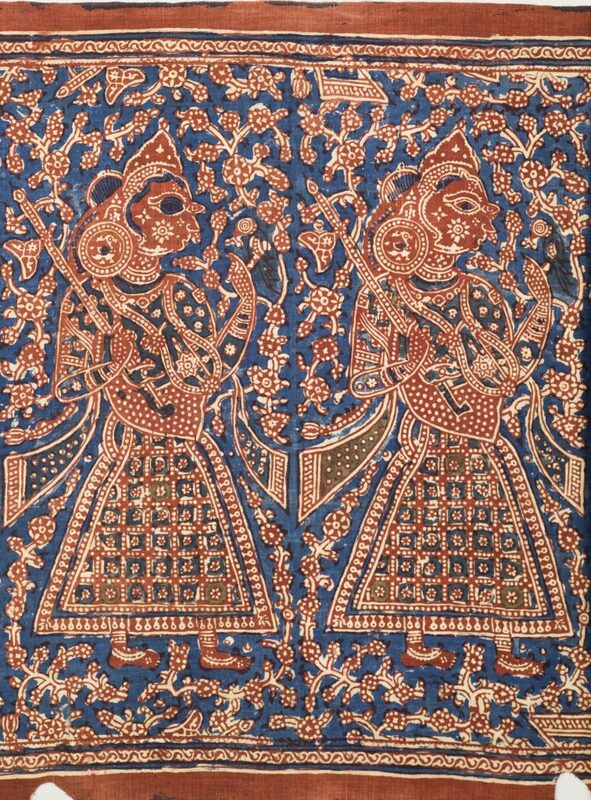 Beginning about 2nd or 3rd Century BC, Indian textiles were in demand worldwide – traded through land or sea routes. From Europe in the west to China in the Far East. They were exchanged for gold, spices and other valuables. The image below shows a ceremonial cloth that was made in Western India and exported to Indonesia. Image of a 17th century ceremonial clothe that was traded to Indonesia. 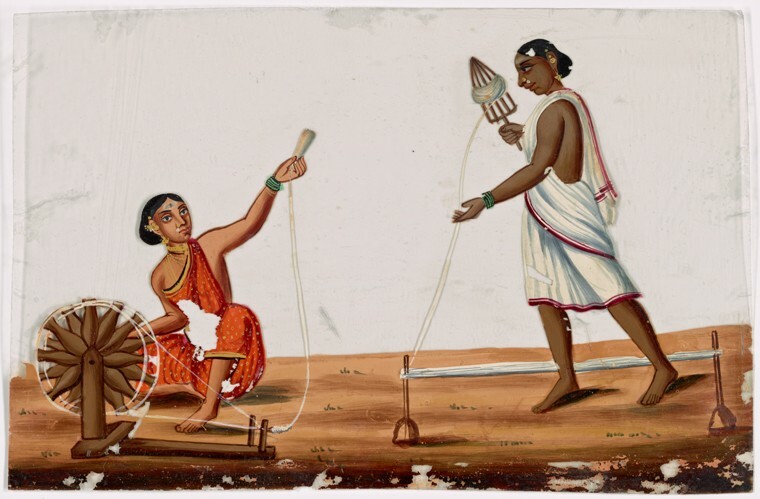 Textiles were central for Indian commerce. But even more central for self contained, integrated village communities in many parts of India. Crafts and cottage industries weaved the fabric of village unity and autonomy – made them a happier place to be in. The happiness was not to last. The East India Company was set up with a Royal Charter in 1599. In 1615 the Mogul Emperor in India gave the Company exclusive rights to reside and build factories in India. Rights to acquire territory, mint money and form an army followed. The Company became a state within a state. It took control of textile manufacture and trade, setting up factories and imposing taxes and rules. Gradually manufacturing activities began shifting to Britain. 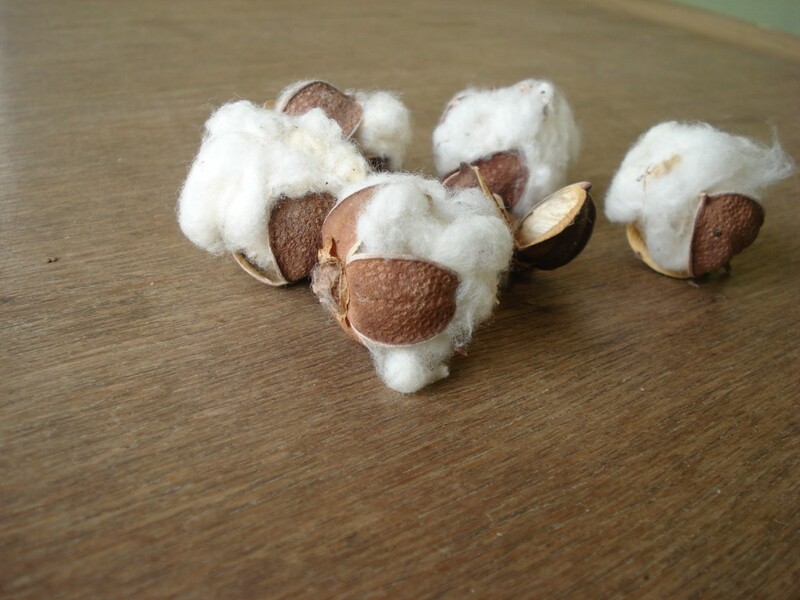 India exported ginned cotton to English cloth and bought back cloth made from the same cotton. This could have been the beginnings of the end for Indian textiles. Weavers and printers lost their independence and often their source of livelihood. They struggled to keep alive their creativity and to innovate. Indian elite began emulating western dress style. Age old traditions were at risk of gradually becoming extinct. They began to migrate. Spinning wheels disappeared. there was no use for them. The structure of the village economy collapsed. Leading to more migrations and seasonal unemployment. For many, the Indian villages were no longer a happy place to be in. The situation became worse in the eighteenth century. Britain too suffered. Cheap cotton cloth led to a decline of wool and silk industries in Britain. 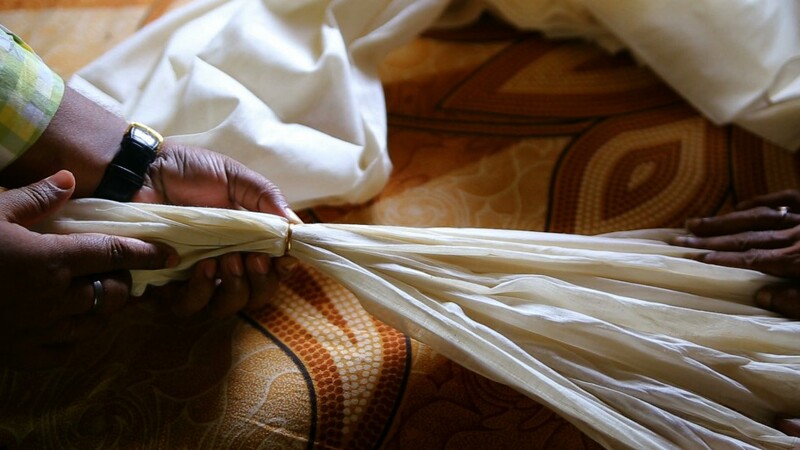 Cloth made from Indian cotton fabrics was used to buy slaves and ivory from Africa. With the end of the slave trade, a new form of slavery began to take shape – indentured labour from India. Some times forced, sometimes ‘voluntary’. The French ‘recruited’ indentured labour from their Indian territories for sugar plantations in Mauritius. the British for places as far as Fiji, the Caribbean Islands and Africa. Gandhi came in close contact with indentured labour in South Africa, helped them fight their causes. He was deeply influenced by them and they by him. They helped him forge a new identity. By the time he returned to India about a hundred years ago, he was well prepared to face the challenge of reversing the decline of India. To help its villages take control of their destiny. Khadi was revived. It became a symbol of a new look India, a new look Indian village. He also forged non violent struggles for Indian farmers and textile workers. A combination of grassroots programmes and non-violent campaigns for the rights transformed the Indian independence movement. When Gandhi returned to India, the campaign for home rule was a monopoly of the elite. Within a few years it became a mass movement. Which then evolved into a freedom movement. Sites of protests became places of camaraderie – stopped being platforms for elite power play. The idea of boycotting foreign goods and buying Indian first caught people’s fancy in 1905. Plans to partition Bengal on communal grounds triggered a spontaneous and visible uprising. Gandhi was still in South Africa at the time. But it influenced his thoughts. In India, Swadeshi, the Buy India movement was submerged into Swaraj – self rule. Swadeshi receded into the background. For Gandhi, modernity in its unfettered form posed a greater threat than foreign rule. To mitigate the threat, Swadeshi would have to play a central role. Search for ‘true’ Swadeshi, one. that would strengthen local communities led him to khadi. Khadi became the new look Swadeshi. It was a master stroke. Khadi soon became a symbol for self-reliance. And for peace and simplicity. A perfect antidote for the greed fostered by modernity. A way forward for autonomous and connected communities of the future. Khadi created a new nationalist identity. It relieved the pressure to emulate the Sahib’s dress style – often unsuitable for Indian climate. A white khadi sari, or shalwar khameez, for women and kurta pajama for men. It became the norm for activists. The white Gandhi topi (cap) was crafted with care. A lot of research went into selecting the right design. It was an instant hit. Khadi was an equaliser par excellence. The same simple topi for all. Gone were the days of traditional head wear which separated the high from the low. Khadi was great for mobilising. Individuals could ply the portable spinning wheel, a new invention. Everyone spinning away at political events created a buzz, focused minds. Street protests looked like a sea of white khadi, creating a theatrical effect – gave a sense of power and defiance. Khadi became a medium for creating and sustaining grassroots. Protest and Grassroots drew strength for each other – khadi was a uniting link. 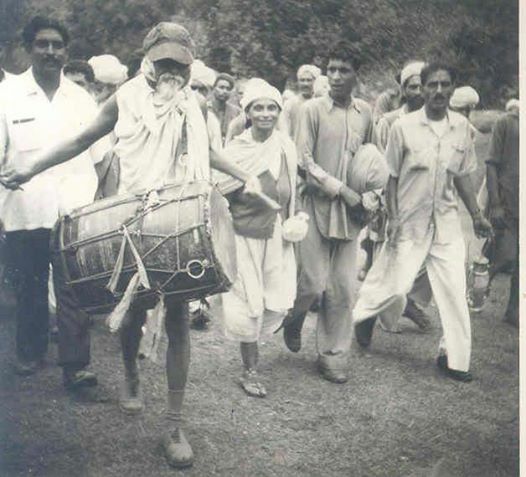 Photo: Wikimedia Commons Dandi salt march in 1930 in defiance against tax on salt. Indian politicians accepted Gandhi’s leadership. He had the masses behind him. But most politicians did not buy into Gandhi’s vision of India’s future. A village based economy and local autonomy didn’t fit in well with their sense of power. When India gained independence, politicians in power no longer felt it necessary to pay heed to Gandhi’s quirks. They saw no evil in their desire to become modern. Or in their dreams of constructing large dams and creating mega industries. Gandhi was assassinated in less than six months after India became free. Gandhi loyalist were demoralised. A sense of disarray began to set in. A dramatic event in the third year of independence changed it all. Vinoba, a close ally of Gandhi for about thirty years, was offered a hundred acres of land for landless labourers. It was a spontaneous offered aimed at bringing an end to a violent conflict over land in the village. It was followed up by similar offers in neighbouring areas – a small act of land gift soon became a movement. 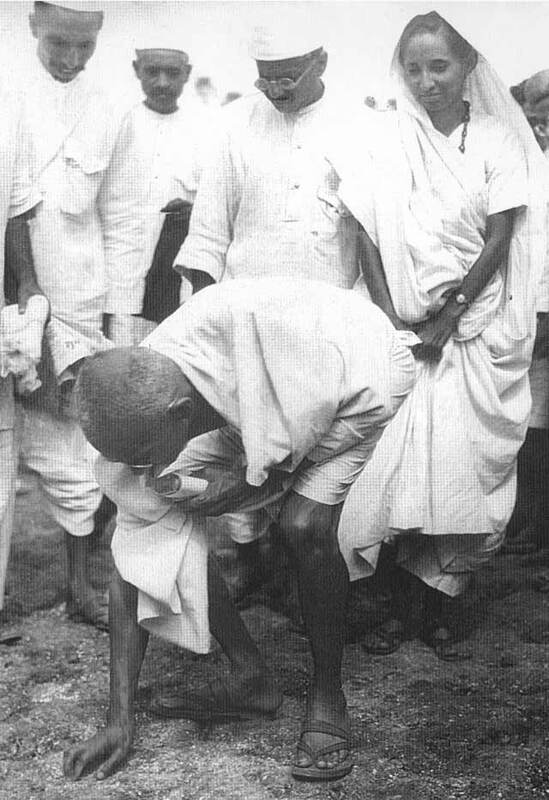 Gandhi’s non-violence which worked for gaining freedom could also work for resolving internal disputes. Greed had an antidote – generosity. Modernity could have a different meaning. A spirit of reconciliation could eventually replace the need for a state dependent on rule of law. Gandhi’s loyalists found a new energy. Their message resonated with the rural masses. Bhoodan, as the land gift movement was called, had wider impacts. Cottage industries were added as a niche area for planning. Khadi survived the day. A law was enacted to establish a statutory body (KVIC) to support khadi and other rural industries. This was in 1957 when the Bhoodan movement was at its peak. The movement continued to have a significant political influence for about twenty five years. They used the influence to good effect. Rural industries have thrived. Khadi alone gives employment to over a million. About 80% of whom are women. A large number in remote rural areas. We look forward to the day when the number reaches 2 million. It may not be far off. New forces are now driving khadi forward. The past three years have been exciting. We have been able to connect with a growing network of khadi enthusiasts. All engaged in trying to give khadi a new look in their own creative ways. it has been happening for a while now. Khadi denim was introduced well over a decade ago. Khadi knitwear is a new introduction. High count muslin khadi has made a come back. Weaves and knits have improved. A sense of autonomy is coming back. Self-help groups have started managing their own units. Khadi is attracting start ups with a social mission and a drive to make an impact. Solar power spinning and weaving is being piloted. New technologies for value addition in the village are being developed. Old seeds are being revived. Organic khadi is a new buzz word. Kala Cotton: A drought resistant variety. Khadi now has a global recognition. Consumers love its feel. They love khadi’s ethics and the khadi story. Khadi is becoming a favourite of costume designers. It has been used for Hollywood block busters. Perhaps the real new look will come when khadi units are set up in Africa. And when it becomes a global symbol simplicity. For peace and freedom. When a khadi T’shirt becomes a must wear for peace marches and demonstrations for positive change. Kishore Shah, informed by the author’s varied experience and research of more than fifty years. M. K. Gandhi, An Autobiography or the Story of My Experiments with Truth, Ahmadabad, Navjivan (1927) Various editions available in hard cover, paperback and online. Reviving Khadi: The Early Phase – Blog by Kishore Shah based on the three Khadi Chapters in Gandhi’s Autobiography. Documentaries That Connect – Susanta Biswas Review of documentaries and promotional clips on khadi by Susanta Biswas. 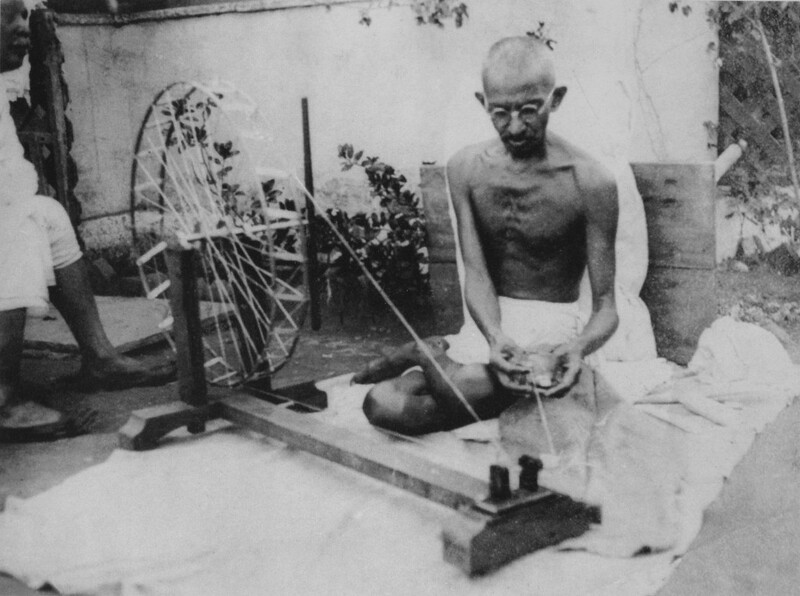 Visit Gandhi Online Resources, a great resource for khadi, Gandhi and Vinoba.